You must agree to the contents of this page before doing anything. 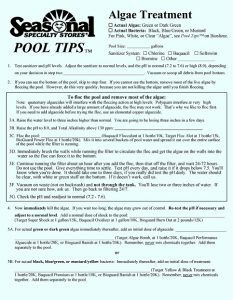 We write Pool Tips™ for the exclusive use of our own local customers. They are meant as a summary of general information, to be discussed in our store, with our staff, to determine which items are best for specific pools. Do Not reproduce for any purpose whatever. They are all copyrighted, and we take our copyrights very seriously. Don’t Blame Us for anything. It’s free advice, and worth the price paid. We’re trying to help, but pools are complex, and chemicals and electricity are dangerous. The limit to our liability is the price you paid, which is zero. We take no liability for how you use this information. Only if you have read all of this page, understand it, and agree to it should you continue by following the “I AGREE” link below. This will bring you to the live index of our current Pool Tips™.